Vertagear PL6000 Series ▷ Size & Buying Guide on GOTURBACK.UK! The PL6000 from Vertagear is a magnificent-looking chair, standing tall and wide. The older model PL6000 had some problems with the star-base in which the generously sized castors put too much strain on the aluminium base, causing deformation in the metal, cracks and metal fatigue in a surprisingly short time. The product has been thoroughly revised by switching to a sturdier, thicker supports, which has resulted in a solid feeling chair that supports bigger users without effort, even in a reclining position. A reclining position is achievable, with a great range of tilt on offer. The armrests are fully mobile, able to be raised, lowered, swivelled and tilted into almost any configuration. This chair stands a majestic 54 inches tall at its highest, with a generous twenty-inch spread from armrest to armrest. The seat is also 20 inches deep, meaning that even larger bottoms will be comfortably supported. The chair is made from steel and aluminium alloy, padded with high density foam and covered with PVC leather, a leather look synthetic fabric. The seat can feel very hard and rigid at first, but this gradually softens and shapes to the user’s body, rapidly becoming more comfortable within a few hours of use, and maintaining its firm cushioning support even when subjected to many hours per day of use. The fabric is perforated to carry excess body heat away from the user, and to prevent the accumulation of sweat when play becomes intense – which is something of a problem with closed cell fabrics like non-perforated pleather and plastic-based fabrics which are impermeable and do not allow moisture to evaporate easily. The PL6000 comes in basic charcoal black, with flashes of colour available in blue, red, white, green and yellow. The touches of colour emphasise the solid mass of the chair, while the all-over black version is subtle and elegant – ideal for those who enjoy understated minimalism. A lumbar cushion is available too, but it does not come with fixings. This means that the cushion must be re-placed and adjusted after every bathroom and snack break, which can become tiresome, especially if finding the perfect spot for it is something of a trial and error process! However, the cushion itself is beautifully shaped and offers great back support, especially during those marathon gaming or computing sessions, so once you get it in the right position for you (perhaps why there is no fixings?) your back will thank you, and reward you with no pain. 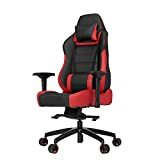 A neck support cushion is also provided, and this is great whether you are sitting upright gaming, or fully reclining to take a quick power nap, supporting your head and neck while you focus on other things. The PL6000 is a big chair. It will need a generous amount of space and is not designed for those under 5 foot 9. (The chair is designed for those up to 6 foot 11, so it is highly unlikely that many people will top out this chair.) Even people who are an inch or two into the specifications range find themselves like a kindergartener sitting on teacher’s chair: feet dangling, not quite touching the ground! If this is an issue, exchanging the gas lift for a shorter one works well. The generously wide seat means that bigger players can sit comfortably, without having their thighs pressed against the side struts and without having to clamp their legs together – an unnatural and awkward position to adopt for any length of time… The chair is designed to support users up to 440 pounds or 200 kilograms, and it can do so, solidly, sturdily even in the extreme of the recline position without feeling unstable or wobbling. · Effortless Assembly - Patent-pending mechanical structure that requires no more than one person to assemble. · 4-Directional Armrests - Armrests are cushioned and contoured to the shape of the arm and adjustable in four directions. · Seat Angle Adjustment - Lever with adjustable resistance and locking system. Lock up to five different positions.